I served as deacon at the Cathedral Eucharist in Christ Church Cathedral, Dublin, this morning, reading the Gospel and assisting with a chalice at the administration of the Eucharist. The Revd Garth Bunting presided, and the Revd Canon Dr Virginia Kennerley, editor of Search and a former lecturer in the Church of Ireland Theological College, was the preacher. The Mass setting this morning was the Missa brevis Sancti Joannis de Deo by Joseph Haydn. This Missa Brevis or ‘Short Mass’ in B-flat major was written by Haydn around 1775 for the order of the Barmherzige Brüder (Brothers Hospitallers) in Eisenstadt, whose patron saint was Saint John of God. It is scored modestly for soprano, four-part mixed choir, two violins, organ and bass, and is also known as the Kleine Orgelsolomesse (‘Little Organ Mass’) because of the extended organ solo in the Benedictus. Haydn keeps the movements Gloria and Credo extremely short by setting several clauses of the text simultaneously in different voices. So, while the setting means different passages are assigned to different parts and are heard simultaneously, the composer does justice to the liturgy but keeps the music short. Haydn’s Benedictus is the only movement that is not in B-flat major, and set for a solo voice. This is the longest movement and is a dialogue of soprano soloist and organ, described as “expressive, elegant, and ornate melodic lines.” It is followed by a repeat of the Hosanna. Later this afternoon, despite forecasts of heavy rains, two of us went north to Skerries for lunch and coffee in the Olive on Strand Street. The forecasts proved wrong, and we spent most of the afternoon at the North Strand, Skerries Harbour and Red Island, which was the venue for the Skerries Rowing Club Regatta. 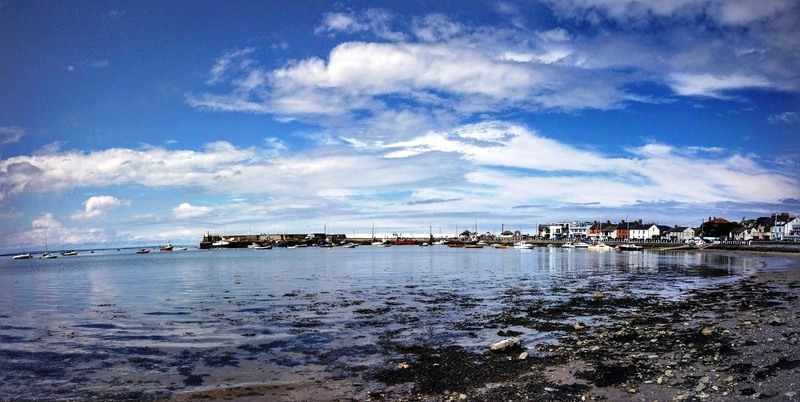 Skerries Coastal Rowing Club is the youngest of all the clubs that are part of the governing body East Coast Rowing Council (ECRC). Sea rowing clubs are a particular tradition on the east coast of Ireland, from Dublin through Wicklow to North Co Wexford. They row and compete, by tradition, in clinker built wooden skiffs on the east coast, and coastal rowing is undertaken by crews of four with one sweep oar each, and a coxswain. 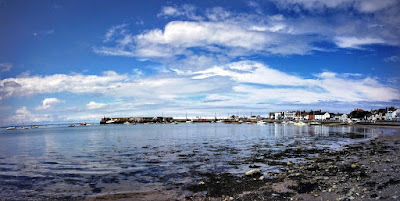 Skerries Coastal Rowing Club has no club house, and so during the season it meets daily at the slip on the sheltered side of the harbour. This afternoon’s regatta provided joyful sport and entertainment. There were crews from all age groups from Arklow, Wicklow, Greystone, Bray, Dalkey, Dun Laoghaire and Ringsend, as well as Skerries. Sea rowing has some different traditions from the rowing I know in Cambridge, but one familiar sight was the variety of blades, lined up in club colours, making this a colourful, sunny, summer afternoon. The entertainment provided by a band from the Dublin Airport Police and Fire Service continued as we left Red Island for a walk along the South Strand, and the sunshine continued late into the afternoon.